Conventional roller coasters, whether they are wooden or steel, use two rails. As the term implies, a single-rail roller coaster features a track that incorporates one rail. Think of it as a monorail, with the train hugging a single beam—except this monorail is capable of turning upside down and delivering a thrilling, yet smooth ride experience. There have been a few isolated examples of single-rail roller coasters through the years. But the concept never really took hold. For the purposes of this article, a "single-rail roller coaster" refers to the coasters designed and manufactured by Rocky Mountain Construction. The ride company debuted the first two of its single-rail coasters in 2018 with the Wonder Woman Golden Lasso Coaster at Six Flags Fiesta Texas in San Antonio and RailBlazer at California's Great America in Santa Clara. Inverted, in which the train hangs suspended beneath the track. Wing, in which the cars are located on either side (or the wings) of the track. Regardless of the category, nearly all steel coasters use two rails of tubular steel track. RMC disrupted the amusement industry with the introduction of its innovative iBox track. 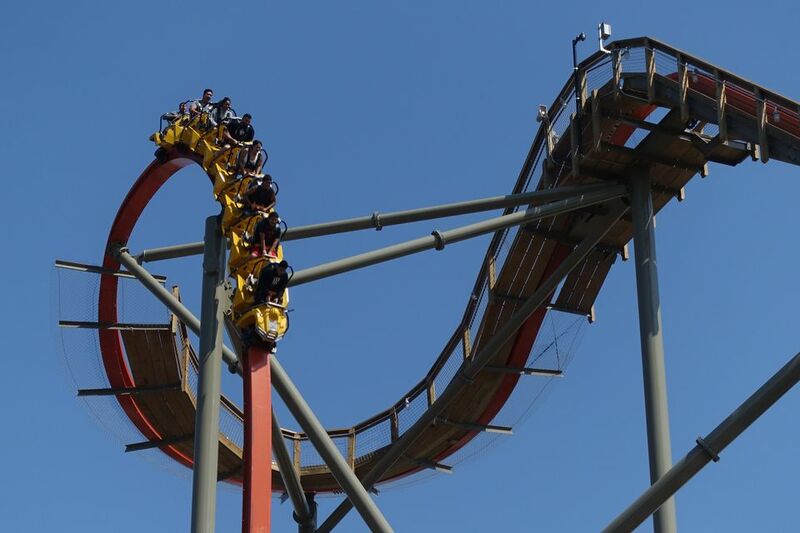 The first ride to feature it was the New Texas Giant, which opened in 2011 at Six Flags Over Texas in Arlington. The company took the Texas Giant, a traditional wooden coaster that had become excessively rough, ripped out the wooden track and replaced with its steel iBox track. The converted, hybrid wooden and steel coaster is now wonderfully smooth and hugely popular. RMC has successfully transformed many aging, rough coasters, including Twisted Colossus at Six Flags Magic Mountain. Instead of a rounded tubular steel track, iBox track is flat on top and shaped like the letter "I." The train's guide wheels fit into the side channels created by the "I" shape. RMC's single-rail coasters also use iBox track. Instead of two narrow rails, however, they use one wider rail. The company refers to it as "Raptor Track." Unlike RMC's hybrid wooden and steel coasters, its single-rail models include a steel structure and steel track. The single-rail rides look unique as they require fewer supports than a typical steel coaster. And while their single rails are wider than either of the two rails on a conventional tubular steel coaster, they are quite narrow at 15.5 inches across. The rides give the appearance of a thin ribbon of track unspooling in the sky. The single-rail concept delivers a unique ride experience as well. Because the track is so narrow, the trains are also narrow. Each car only has a single seat. Passengers don't have anyone sitting to the left or right of them. Because the track is hidden under the center of the train, it seems as if riders are be floating, mysteriously suspended in the air. With few supports and only a single rail to navigate, RMC says the rides' elements feature unusually quick turns and twists. They unleash some powerful G-forces and bursts of airtime. The first two Raptor Track coasters include three inversions. Despite being flipped upside down and subjected to abrupt changes in direction, passengers typically enjoy especially smooth rides. While steel coasters are generally less rickety than wooden ones, they can still be rough. That's partly because the two rails can be misaligned in sections. If the left and right rails are even slightly out of whack, the trains can shimmy and shudder. Since RMC's rides only have one rail, you don't need to worry about anything getting out of whack.